I am excited about this book. 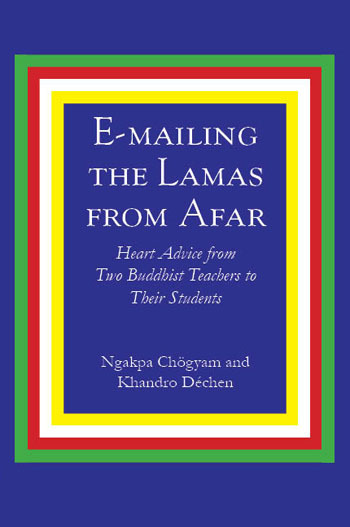 It is the first new one from my lamas, Ngak’chang Rinpoche and Khandro Déchen, since 2002. It is perhaps the most accessible book they have written, and I hope it will introduce them to a new generation of Aro students. The book is a collection of replies to emails sent by students. Most Aro apprentices see our lamas only twice a year, on retreats. Email conversations are their main means of individual teaching. The book, therefore, gives some sense of what it is like to be an apprentice. The personality display of the lamas comes through clearly: the nonlinear whimsy of Ngak’chang Rinpoche’s humor and the kind good sense of Khandro Déchen’s advice. The questions asked are likely to come up for all serious Vajrayana students, so the answers may be interesting and useful anyone practicing Tibetan Buddhism. The lamas comment on many topics that are important but too small and diverse to fit in a conventional book. Some of the discussion is theoretical, but in most cases the students’ questions come out of the emotional complexity of everyday living. Vajrayana insists that such concerns are not an obstacle to practice (as Sutrayana might); they are the arena and fuel and essence of practice, and of realization too. The email exchanges are organized into chapters. Each chapter has an introduction by the editor, Lama Zér-mé Dri’méd. These essays give context for the topic of each chapter, and are exceptionally clear, concise teachings themselves. You can read more about the book, and order it if you like, here. [Update: it is now also available for $3.99 on Kindle]. Below I offer two examples of email replies, from the book, followed by an excerpt from one of the introductory essays. Apprentice: I would like to ask you about practice. Why is it that my practice is often such a contrast to my everyday life, with the depression that seems to dominate me for periods? In silent sitting I am able to relax. At first I tried to stare into the face of my depression. I tried to find, force, and face it, and ‘stare it down’—but finally I relaxed, because I could never get my depression to rise. Khandro Déchen: Depression does not rise—it sinks, and then you sink with it. Apprentice: What happened was that an overwhelming and ongoing joy took over my sitting practice; joy about nothing in particular—but simply joy in terms of practising integration with whatever was arising in the sense fields. Khandro Déchen: Quite. It is not possible to be depressed whilst integrating with the sense fields. Apprentice: Why am I unable to take this practice into daily life? Getting up from the cushion and getting into contact with anything that reminds me of me and my problems always starts the spiral of depression again. Whenever I force myself onto the cushion, I am fine; leaving the gompa starts the countdown to hell. Khandro Déchen: Yes . . . it would. The problem you are facing is one of integration. Integration with the sense fields is naturally the answer whilst sitting – but there is no integration when you leave your cushion. You should experiment with integrating your problems into your sitting practise. Deliberately think of one of your ‘life problems’ for ten seconds and then let it go. Repeat this ‘thinking of a problem for ten seconds’ every three to five minutes as you sit. Try this suggestion and let us know what happens. The ‘ten second problem’ will ruin your sitting at first – but gradually you will develop a spaciousness with regard to the concepts that give rise to depression. Apprentice: I am feeling as though I know nothing. Teachings used to make intellectual sense to me—or so I thought—but at the moment it seems as if I need to go back to the start and try to understand something fundamental through my heart. Khandro Déchen: It might be more a question of silent sitting. No matter how much intellectual sense we make, it will be of our making and therefore little better than any other fabrication. If you simply return to more basic teaching and try to work your way forward again, even via a more emotional sense, you will merely arrive at the same destination. Apprentice: Is the heart part of the path? Khandro Déchen: Not particularly. The path is connected more to your buttocks than your heart – in terms of understanding the teachings at least. You have to sit. If you gain glimpses of emptiness – your ‘heart’ will make sense of itself. Apprentice: It feels as if this is a step along the way, just an unexpected one. It appears to be cutting a certain sort of grasping. I realise that I have read about non-duality, listened to teachings about non-duality, and talked with other apprentices about non-duality—but without any practical sense of what that really means. Ngak’chang Rinpoche: Quite so. It would appear that this is a splendid opportunity and inspiration to sit. I used to get highly excited by the teachings I heard when I was first in India. I was so excited that I tried to explain them to others – but the more I tried to explain the more lost I became, until I ended up losing the inspirational understanding I had. Inspiration occurs when we hear teachings – but that inspiration does not last if there is insufficient basis in practice. That does not make the inspiration worthless or invalid – it simply means that we have to actualise the inspiration through our silent sitting. Apprentice: I feel inspired by the sense of the teachings rather than the words of which they are composed. Khandro Déchen: Excellent – that is a most useful approach with material on nonduality. Apprentice: And being in your presence moves me to open in trust. Ngak’chang Rinpoche: Well—gag me with a spoon—if you pardon the expression. I think I would rather you simply sat. I am the last person you should trust. After you have spent more time sitting, trust will be self-accomplished rather than having to be inculcated, even through devotion. Devotion is only feasible through experiencing emptiness. If the experience of non-duality is the starting point or base for Dzogchen, it might seem that there would be no place to go from there. The path and the fruit would be unnecessary. In an absolute sense, this is true. But Dzogchen is a vehicle or yana because as ordinary human beings, we do indeed go somewhere. We wander off and forget who we are. I wonder if there is anyone involved in any spiritual practice who has not had the experience of forgetting what they know and then remembering again and thinking, “Oh, I remember now. How could I have forgotten that?” Returning from those moments or days or months of forgetting are the path aspect of Dzogchen. The practice aspect of Dzogchen comprises all the ways that we can be reminded of who we really are, what we have been all along but have forgotten. That is why Dzogchen includes such a great variety of practices. Dzogchen practices can be elaborate—in terms of cycles of physical exercise, for instance—but many are deceptively simple. Dzogchen includes practices that can be performed in a moment, where remembering to practise and practising are simultaneous. There are also practices in Dzogchen that consist entirely of how one views phenomenal reality. An accomplished Dzogchen practitioner might not feel lost for long in the wilds of office theatrics, because opportunities to practise are constantly presenting themselves.